When I came to the States to live with my new family, I had a lot of apprehension because it was my first time meeting my in-laws in person. But I am so lucky because all of my husband's relatives and family are very kind hearted. I never had any problems dealing with them in any way whatsoever. 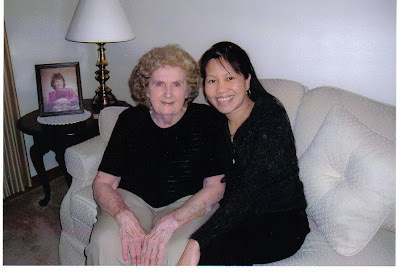 I just wish that my mother-in -law is still around at the time when I arrived, especially when I had my first born. She passed away before I arrived in the United States. But anyhow, Aunt Athelea, my mother-in- law's sister, is very nice to me. She told me that I am her adopted daughter and that I can call her Mom. I was so happy about it because I really needed a "mother figure" that could guide me through motherhood. We called my father-in-law the other day and he told us that Aunt Athelea is in the hospital, that she was diagnosed with cancer. We were saddened by the news, but all we can do is to pray for her, that God may cure her. My wish for this holiday is this, may God heal all those people who are suffering from terminal illness. We just got done watching K-PAX movie, have you seen it? Its a science fiction drama movie. It's one of those kind of movie that will keep you guessing right to the end. This is a story about a stranger who calls himself Prot (Kevin Spacey) who seemingly appears out of nowhere following a disturbance at New York Grand Central Station. He claims that he came from a distant planet called K-PAX, Prot draws the attention of jaded Dr. Powell (Jeff Bridges), whose initial skepticism soon turns to fascination and amazement. Even a team of scientists are at a loss to explain Prot's detailed knowledge of the star system he calls home. But with Prot's return to K-PAX fast approaching, the search for answers intensifies and the mystery takes on pulse quickening proportions. It's a very good movie to watch, got a lot of lesson to learn... I leave you with this inspirational though my friends, may you have a good night/day! God bless! "God is more interested in our availability than our ability, more in our Godliness than our gifts, more in our disposition than our position."